A beautiful 12kt rose gold and royal blue enamel trim Gerogian memorial locket pendant featuring 42 creamy white seed pearls, approx. 1.5mm and 44 modified cushion cut off white foil back glass paste, approx. 1.8 x 1.8mm. 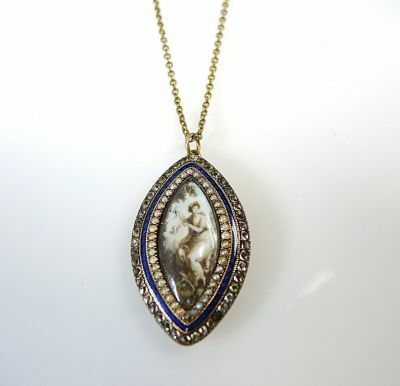 The center of the pendant features a painting of a woman with initials. The locket pendant is accompanied by a 9kt yellow gold link chain.